To date, many of the attempts to remedy inactivity in office environments have been focused on products such as furniture, office layout, architecture, organisational issues and providing time for physical activity and not the actual work task. Your task is to explore ways to invite the body back at work. While observing office workers my team wanted also to incorporate ourselves into the research since our school environment is very similar to office environment. We kept movement diary to track our daily movement, than we visualised data through info-graph. Results shocked everyone. We sat for over 12 hours and were active for only 1% of our day. This showed us the scale of the problem and proved that this problem is valid for everyone working in office environment. In our exploration of movement topic we tried also less conventional methods. Body-storming was a way to brainstorm through our bodies about movement we would like to encourage and explore what type of movements are possible. It was a playful way to see that movement can also be spontaneous and less enforced. Visiting different offices and interviewing professionals from different areas proved us that lack of movement is a problem in all kind of offices. We observed people trying various sometimes unexpected positions on a chair once the sitting became uncomfortable. Hacking own office space showed that provided solutions are not good. Although some offices were equipped in desks with adjustable hight what enabled standing position while working, not many people used them and constant standing was also uncomfortable. Through detailed interviews we also got to know that people are aware of importance of physical activity and try to incorporate it outside office, but they are too busy to think about it during work. Some offices provided a gym for workers and time during week that workers could use for exercises. some of them even suffer from injuries. They want to move more and be healthy. My team created two workshops. We tried to engage people through playful tasks involving lego and puzzle where they could show us how they wish they office could look like or how a wearable could improve their work environments. Open set up of Bildmuset in Umea allowed us to meet people from different occupations and work environments. Another workshop with architecture students allowed us to ideate how space of office can encourage movement. We used architects knowledge about designing workspace to see how can we use office planning to encourage movement. Both workshops were opportunity to test our early ideas and look for more opportunities to develop concepts. We evaluated those concepts keeping in mind that we want our solution to be inherent, have system approach and ideally form new healthy habit. We wanted to get away from annoying reminders and individual, desktop based solutions . We decided to focus on portable workspace since we saw this as an area with most opportunities. We designed final model of our concept that consists of a personal token - wearable , check-in and check-out board and small board for transferring files and connecting to desktop. Our model was designed in solidworks and than miller from foam and painted. We also used lasercut wood for bigger parts. Interactive part indicating transfer and reciving of files was prototyped using Arduino and neopixels. 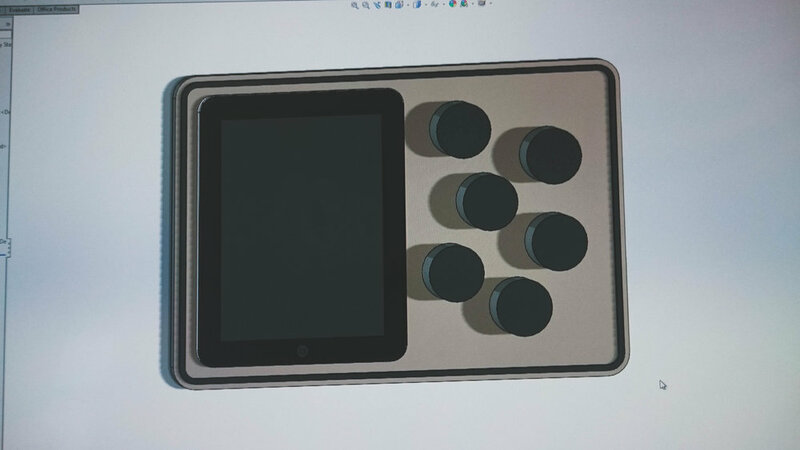 To prototype screen we used iPad. 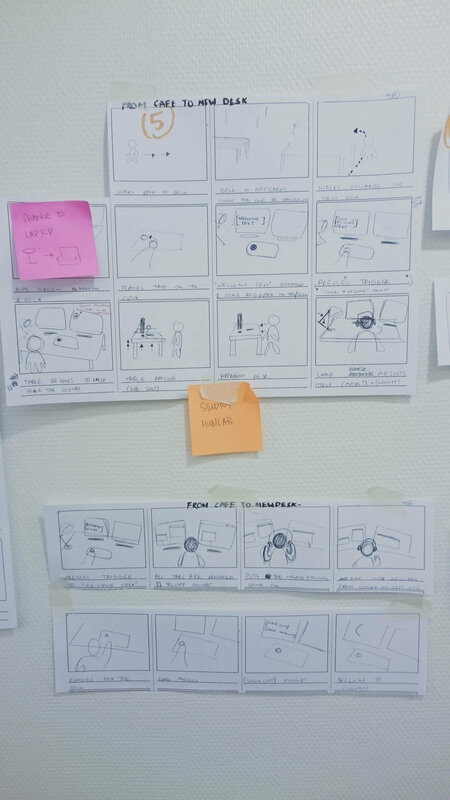 To show our concept we decided to create a storyboard showing use of our project and than turn it into a video. This medium allowed us to showcase our concept in quick, dynamic and interesting way. To highlight open space of the office with our product we filmed in various locations. In my team we decided to give everyone an equal chance to be the leader. We rotated the leadership so everyone could experience how much of privilege but also a responsibility it is to be project manager. We all contributed to research, ideation and creation of final concept through many brainstorm and ideation sessions. I worked on graphic assets for our video that we used in prototyping screens as well as structure of the presentation and supporting graphics for explaining our concept. This project thought me that having trust in your group members and their abilities can make team work much easier and more pleasant. Beside developing my design process and skills in graphic design and prototyping I learned a lot about teamwork and importance of good working atmosphere. I also had pleasure to work with amazing people that all had different background and experience and they thought me as much as tutors.